LONDON (ICIS)--African polymer price levels are unchanged this week as the market remains quiet due to extended holidays following Eid ul-Adha. Although the religious festival is now over, many players remain on holiday and some company offices remain shut. Expectations for September were mixed among sources, mostly due to complications in upcoming supply levels. Evolving geopolitical events are putting pressure on supply routes. The trade war between the US and China may leave some US product searching for alternative destinations, with Africa a possible destination. Polyethylene (PE) expectations are mixed, from soft to stable. Some players expect sellers to maintain current price levels, even though demand is likely to increase as the rainy season comes to an end. September is traditionally the beginning of a stronger season in Africa. Another player thought that the excess of supply in the market would counter any upward pressure created by demand. The source had already seen very competitive offers from countries such as Qatar that would instantly undermine rollover offers. A supplier into East Africa said it would attempt to offer price increases but this would be on limited volumes. There was little support for hikes on the market this week. The supplier cited increasing southeast Asian PE prices as a driver for their increased offers. 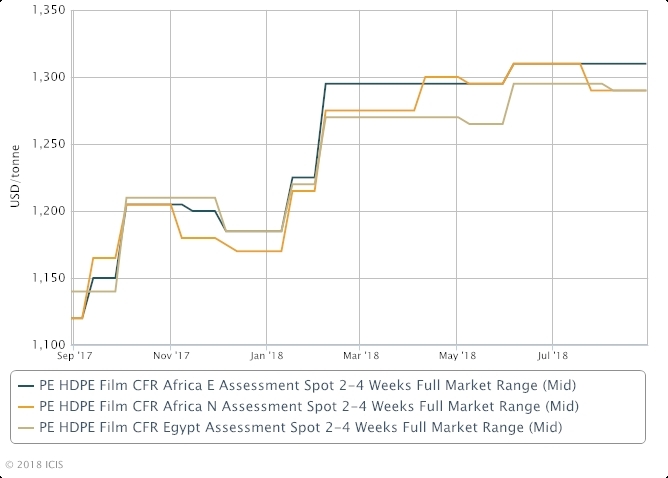 A trader in West Africa noted that South Korean sellers had shifted to offering high density polyethylene (HDPE) roto moulding grade as they could not compete with the current low film price levels. Players expect polypropylene (PP) September offers to be stable to firm, although they are also not discounting potential for prices to drop due to price competition. Some players think that there is currently not a surplus of material available in Africa and that prices could see modest increases up to $10/tonne.